Ruthenium is a transition metal in the platinum group. It is used to harden platinum and palladium, and in the formation of high-temperature superalloys. Ruthenium is also used in microelectronics and dye-sensitized solar cells. Global consumption of ruthenium dropped for the third successive year in 2009. Demand decreased by 18% to 17,900 kg in 2009 relative to that in 2008. The consumption of ruthenium in electrical applications fell to 10,500 kg, an 18% decrease relative to that of 2008; consumption of primary ruthenium increased slightly in the hard disk industry. Electrochemical demand remained the same in 2009 as in 2008, at 2,960 kg of ruthenium, and its use in the chemical sector fell to 2,770 kg, a 36% decrease compared with that in 2008. 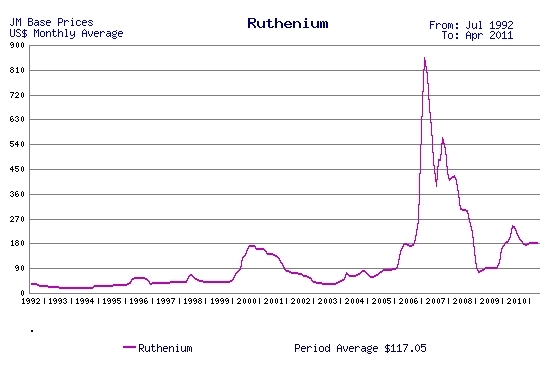 Other demand for ruthenium decreased slightly to 1,680 kg in 2009. Ruthenium demand is expected to increase as a result of increased demand from the hard disk industry. The ruthenium price began 2009 at $100 per troy ounce and dipped to $75 per troy ounce in mid-February. The price climbed back to $95 per troy ounce in mid-April, where it remained until mid-November. The price jumped to $150 per troy ounce in late November and ended the year at $160 per troy ounce. The ruthenium price increased owing to industrial purchasing and investor interest. Norilsk Nickel (OTC: NILSY) - http://www.nornik.ru/en/production/products_type/32/ - produces ruthenium powder for alloys with high hardness and abrasion resistance. 2010-10-28 - (cf) - Can we store solar energy indefinitely?